Vietnam Professional Federation (VPF) held a meeting with leaders of football teams and a drawing ceremony in Hanoi yesterday, to announce main competition schedule for V- League, the first- ranked prize and 2015 National Cup. 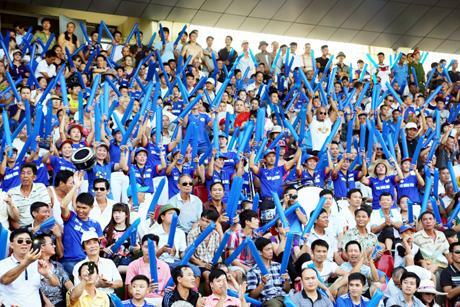 Within the framework of 2015 National Cup, football match between Binh Duong and Hai Phong will open for the 2015 football season, which will take place at Binh Duong sport stadium. 14 domestic football teams will participate in V- League, including Binh Duong, Dong Nai, Dong Tam Long An, Hanoi T&T, Hoang Anh Gia Lai, Quang Nam, Khanh Hoa, SHB Danang, Song Lam Nghe An, Than Quang Ninh, Thanh Hoa, Dong Thap, Hai Phong and Can Tho. V- League’s matches will take place from 4th January to 20th September, 2015. Meanwhile, the first-ranked prize with the participation of eight domestic football teams from Binh Phuoc, Hue, Nam Dinh, Dak Lak, Cong an Nhan dan, Hanoi, Ho Chi Minh City and Phu Yen will start from 11th April to 29th August, 2015. The 2015 National Cup will kick off on April 4, while the National First Division Football Tournament plans to raise its curtains a week later with eight teams participating: Hanoi, Ho Chi Minh City, People’s Public Security, Binh Phuoc, Hue, Dak Lak, Nam Dinh and Phu Yen. In addition, the opening of the 2015 football season will be marked by competition between last season’s V-League and National Cup champions – Becamex Binh Duong and Vicem Hai Phong – at Go Dau Stadium this December 27 for the National Super Cup title.